Unlike almost any other act in popular music today, Shabazz Palaces seem to be operating on an entirely different plane of existence than the rest of us. It’s a plane Bowie and Prince definitely visited a time or three. George Clinton has a timeshare there which he split four-ways with Sun Ra, Flying Lotus and Kamasi Washington. Shabazz Palaces’ acolytes, THEESatisfaction expanded the dimension into whole new areas too. That said, the double edged sword of this interdimensional music exchange lies in accessibility. 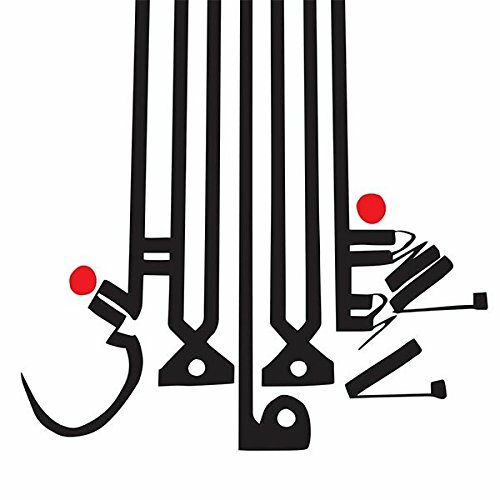 Transmitting Shabazz Palaces’ music across the liminal space between our respective dimensions creates some translational challenges – casual listeners need not apply. In this way, the two new full lengths from Shabazz Palaces, Quazarz: Born on a Gangster Star and Quazarz vs the Jealous Machines offer a challenging, incredibly powerful, listening experience. As if he understood the challenge in bringing this music to the masses, head Palaceer, Ishmael Butler, underpinned the Quazarz records with a concept. Quazarz focus on an alien from another world, Quazarz, who visits “Amurderca” as musical ambassador and quickly becomes disillusioned with all the violence, hypocrisy and racism. There’s also a contempt for technology at play here – Shabazz Palaces’ own tech seems to be as much about beads and wicker as it is about plastic and circuitry. In this way, even though the album is laden with gorgeous loops and samples, it occasionally exhibits a Waitsian, found-sound, junk band aesthetic which adds a natural vibe to the whole affair. The gorgeously dusty “Shine a Light” swims round and round a distorted soul loop reminiscent of the best RZA beats and features Seattle funk/soul act Thaddillac. It’s a clear single tucked within two albums worth of cosmically unapologetic musical futurism. While it fits well within the albums’ framework, “Shine a Light” also offers a catchy, sonic life preserver for any listeners who become unmoored within Shabazz Palaces’ otherworldly aural ocean. Another pop centric track, “Moon Whip Quaz,” starts out like Kraftwerk but soon funks its way into a digital march toward an afro future. It’s the musical equivalent of retrofitting a ’67 Cadillac with an afterburner–all style and grace at 1,000 miles per hour. The same goes for “Effeminence” which feels like a screwed-up and chopped version of Bootsy Collins’ “I’d Rather Be With You” played on 8-bit instruments. In terms of familiar touchpoints, there are nods to the call and response of Butler’s former group, Digable Planets (“Julian’s Dream”) and trippy instrumentals (“Dèesse Du Sang”) which would fit well on the soundtrack for the new Blade Runner sequel. There’s even “Eel Dreams” – a humorous bit of sensual nonsense that, on the first playthrough, I mistook for a Lonely Island song. Fortunately this is the only time on either album in which the conceptualized future became too amusing to take seriously. Ultimately, I am not certain two discs were necessary for this specific output. And while the “Stranger in a Trump Land” theme is incredibly prescient, sometimes the message gets lost in the hazy, smoked-out fog of the music. That said, these albums, played at the proper volume, are certain to pay dividends for listeners prepared to hear, understand and experience the story of Quazarz’ time on Earth. The tale chronicles an alien bearing witness to the damage and decay humanity has wrought on the planet, and upon one another, that can only be seen without digital distraction. So put your phone down, crank the volume up and let Shabazz Palaces tell you a cautionary tale of the bleak future we are living. That's definitely a Kraftwerk sample on Moon Whip Quaz, it's The Model. Only listened to the first album so far but love it.